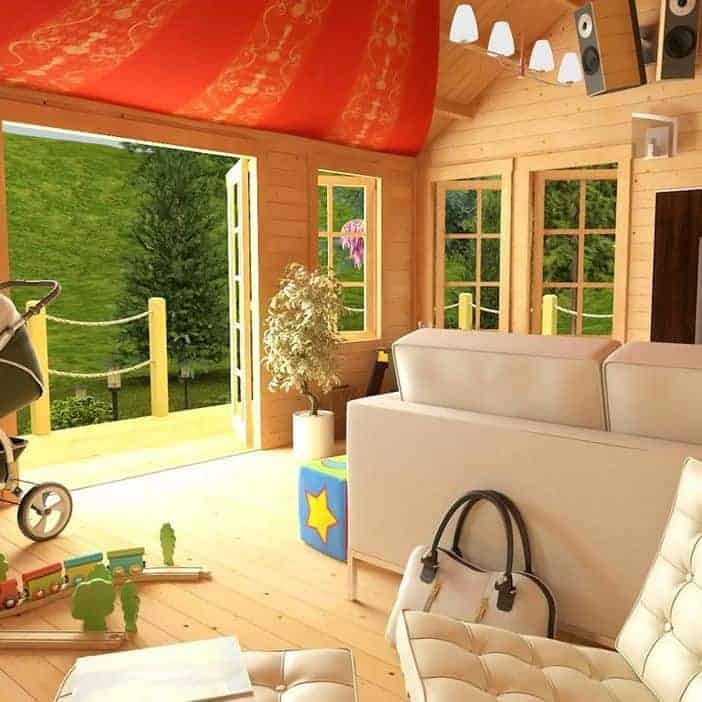 This is a large summer house that has a width of 5m. This is more than enough space to entertain friends, as well as use the building for other reasons, such as a home office. 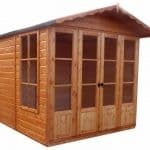 The summerhouse has six windows, which are all opening. These are large windows and they are single glazed. There is an option to purchase double glazing for the model. A strong feature of the building is the 35 mm cladding that comes as standard with the building. This is very strong and will provide some insulation against the cold. 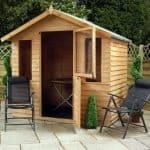 The roof is also excellent, with a 19mm tongue and groove roof that is built for longevity. Shingle roof covering is available, as is mineral felt, and there are a number of different finish options for the building. We have reviewed other Village Hall models elsewhere on this site and this is the middle size building in the three Village Hall products. It is a respectable size, and all three buildings are in fact. 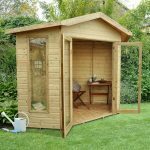 This one has a good width of 5m, which is more than enough for most people to enjoy a great entertaining space or an excellent home office, for example. Like the Village hall I this has 6 opening windows. And like that building, the windows are a lovely size. They stretch down from the top of the wall they are on to nearly two thirds of the height, giving excellent levels of light to the inside of the building. Down both sides of the Village Hall, two windows can also be found, so you have an extremely well-lit interior. We have the issue with single glazing here also, in that it isn’t quite as effective as we would like it to be. Single glazing is not glass, but it is toughened plastic, which is very sturdy. It may be fine for customers to have single glazing but if they are expecting glass or the enhanced insulation that double glazing brings for example, this is not what they are going to get. And when it comes to paying for the extra double glazing option (whether it is in the modern or Georgian style) you’re looking at nearly £500 on top of your initial purchase. Something to think about, but only if you are considering using this building throughout the year. Double glazing will add that insulation you need for a winter building. The good news here is that the windows all open, which isn’t always to be expected at this price point, and shows how BillyOh are offering as much as they can. With this building, BillyOh have provided 35mm cladding. This is a real winner, and we again applaud BillyOh for being sensible with their tongue and groove standard fits. This is a great and tough exterior, and it is perfect for a building of this size, which needs weight behind it. The tongue and groove interlocks, providing weight with securely joined panels, and it looks amazing too. 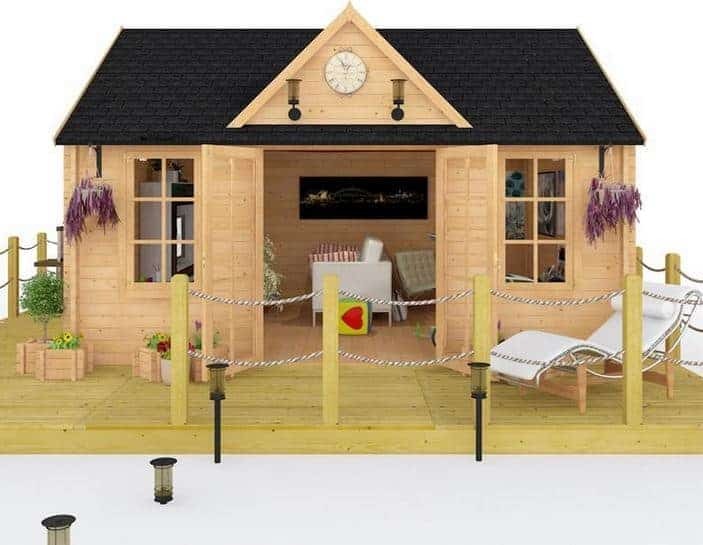 To add even more fun, there is an option for 44mm cladding, which is again quite possibly a nod towards fitting this out for all year round use if you choose the double glazing too. Like with the other Village Hall models, this one comes with just bearers. 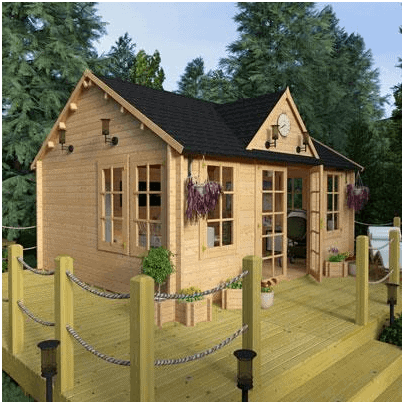 You’ll need to fit a base on top of this and then choose some good flooring, and as it happens BillyOh provides you with an option to buy a 19mm tongue and groove floor. This will certainly give plenty of strength against a busy home gym and its requirements, for example. With the roof, they couldn’t have done any better. A smart and tough 19mm roof is provided as standard, and is is an excellent feature, nice and heavy. It allows you to consider buying roof shingles (they need a heavy roof underneath to be fitted) instead of mineral felt. Both these roof coverings are offered as extras, and are of good quality, but roof shingles look phenomenal, and they also come in a range of colours if you buy from BillyOh. We liked the fact you can have shingles, and not just because they look good. they retain heat too, and all of this adds up. 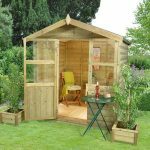 In fact, buy the double glazing, the extra thick cladding and the shingles, and you could have that home office all year round. 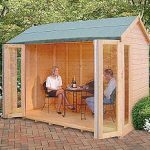 Alternatively, and if you’re happy to have a seasonal building, this is an excellent find, and has plenty of solidity to give you a tough building while you relax and enjoy your cocktails. the building a smart look. If we were to look at this building and offer anything that that was critical, we would offer the idea that paying this much money should get you something as simple and fundamental as solid double glazing. We can’t imagine anyone wanting to use this gorgeous building for just three months every year. Maybe we’re wrong on that, but if we spent this much money, we would want to be sitting there in January, in the warm, and having a drinks party without having to worry about our guests getting cold. Call this a gripe if you like, but we believe in getting your money’s worth here at WhatShed?.The building has inherent value due to it’s size. 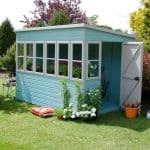 Size really does help get the most out of a garden building, but beneath that there has to be a little more attention to the crucial details. On the other hand you may well be thinking of using this from July-September every year. If so, there couldn’t be a more attractive building for you. Whichever way you look at it, any building that has 35mm tongue and groove in the cladding is off to a great start. This is a quality build that is strong and very capable. Obviously you have to treat it, but that cladding and the tongue and groove in the roof means plenty of longevity. That 5m width counts for a lot, and there is plenty of space in here to entertain people and even have a home office if you wish. This is a big building, and you will have to use 2-3 people to get it up right. This is helped though by the excellent instructions. There is a lot of value here and we are pleased to see so much effort put into details like the cladding. A good building to buy. Final Thoughts: This is a great building to own for many reasons, but we keep coming back to that 35 mm cladding with a smile on our faces. That is real quality stuff, and it will stand the place in good stead, especially as the weather gets rough. Tough and pretty much invulnerable, it will help to keep the longevity of the building going strong. The single glazing is a pain though, and we would have hoped to have double as standard, especially as so many people will think single glazing means glass. Prepare for this and think carefully about what you want the cabin for. A good size, and some excellent strength in the tongue and groove, makes this a good buy, and one that you can add value to with customisation.